A musician of national stature, the remarkable Dutch Lewis is a multi-instrumentalist (about 20 instruments), a vocalist, band-leader, Musical Director, composer, arranger, teacher, mentor to many young musicians, writer to the entertainment and musical press and an after dinner speaker! His musical career goes back nearly half a century to his self-taught beginnings as the 12 and a half-year-old front man/boy of his local school youth club band. As a taste of what was to come, as well as writing the music, he was already singing and playing guitar, trumpet and clarinet. He joined his first grown-up band aged 15 just in time to catch the last years of the ballroom big bands, an apprenticeship he describes as invaluable. Whilst still a young teenager he was invited to become the compere, saxophone player and vocalist for the Cosmopolitans, an international show band specially formed to entertain the NATO Forces across Europe. As well as his front-line duties, Dutch also learnt to play double bass and drums and to compere and sing in several languages. He later settled first in Holland and then Germany where he continued to work with many visiting Americans, including musicians from the great Duke Ellington and Quincy Jones bands. He returned to the UK in the 1960's at the time of the British Blues invasion and toured with many artists including Alexis Corner, Davey Graham and Ginger Baker, later moving on to a wide show-business career with stars such as Matt Munro, Shirley Bassey, Freddy Starr and George Chisholm. By the 1970's Dutch was working across virtually the entire spectrum of the British music industry from orchestral work on flute and bass-clarinet to raunchy saxophones in jazz and blues groups to guitar and electric bass in rock and pop bands, continuing to compose and arrange in every setting from folk-rock to film music. 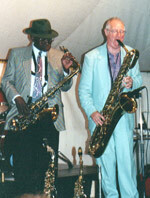 In the 1980's he joined forces with one of his oldest and dearest friends, the Jamaican born veteran sax man Andy Hamilton, working alongside Andy in the Blue Notes and taking over as Musical Director of the Blue Pearls Big Band, with whom he appeared in the film Silver Shine. In the 1990's Dutch finally returned to his first love and formed his own small jazz band - The Dutch Lewis Broadband selecting his musicians for their professionalism, commitment and their ability to play across the styles.